FILE - United Nations African Mission In Darfur, UNAMID peacekeepers patrol the refugee camp of Zamzam at the outskirts of the Darfur town of el Fasher, Sudan, April 13, 2010. Ahead of a June deadline to renew Darfur's joint African Union and United Nations peacekeeping mission in Darfur, U.S. ambassador to the U.N. Nikki Haley said her administration wants "proof" Sudan's government is making progress toward peace and protecting civilians in the region. The Darfur mission, known as UNAMID, costs $1 billion per year. The Trump administration has expressed interest in cutting back on the overall U.N. peacekeeping budget. But analysts say while the mission merits some streamlining, it still serves a purpose. Sudan's foreign minister, Ibrahim Ghandour, argued conditions in Darfur have improved significantly from 2003, when the conflict began. "Now there are no rebel movements in Darfur, no fighting in Darfur, IDPs are returning back to their places, and peace is prevailing in Darfur," he said. Amnesty International's Sudan researcher, Ahmed Elzobier, disagreed, saying the benchmarks for progress outlined previously by the Obama administration have not been fulfilled. "We see reports every day that there is attacks on IDPs in Darfur," he said. "The second benchmark is facilitation of humanitarian access in different parts of Darfur, especially in Jebel Mara, and this is not taking place at the moment, added Elzobier. "The third one is progress on the peace talks, between the armed groups in Darfur and the Sudan government. This was suspended since August 2016.And nothing has happened. And the fourth one, which is inter-communal fighting ... this is still happening every now and then." Peacekeepers deployed to Darfur in 2007. Violence broke out in the region in 2003 when Khartoum was accused of unleashing local Arab tribes on ethnic Africans rebelling against the government for alleged discrimination. Unrest has continued in the years since. 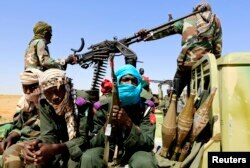 The United States lifted some sanctions against Sudan in January, with then-President Barack Obama citing "positive actions" by the Sudanese government, including progress in ending military aerial bombardments in Darfur. A State Department official said there could be a permanent revocation of sanctions in six months if progress continued, a timeline that coincides with the renewal of the UNAMID mandate. Zach Vertin, a fellow at the Washington-based Woodrow Wilson Center, said the U.N. mission in Darfur could be updated to reflect "current realities." "Things have definitely changed, but it remains a complex security environment with lots of overlapping security concerns, criminality — these kind of things," he said. "So I think the Trump administration has been pushing for major peacekeeping cuts and while streamlining the mission is welcome, gutting it is not." Analysts worry that a large, abrupt cut to the UNAMID presence could impact humanitarian assistance and civilian protection in Darfur. "UNAMID has been a failure by any reasonable peacekeeping standards, but failing doesn't mean they haven't provided some protection," said Eric Reeves, a senior fellow at the FXB Center for Health and Human Rights at Harvard University. "That protection would disappear with the kind of cuts that are being mooted within the debates at the Security Council," he added. The government of Sudan does want UNAMID to leave, but carefully, said its foreign minister. "We want a careful exit strategy in accordance with the agreement signed between us and the A.U. and the U.N. And on the basis of that, we are accepting any reasonable evaluation in all places where UNAMID is based," said Ghandour. "So we are not talking about an immediate, total exit. We are talking about an exit strategy on the basis of conditions on the ground." In March, Ambassador Haley accused the U.N.'s peacekeeping mission in the Democratic Republic of the Congo, known as MONUSCO, of "aiding a government that is inflicting predatory behavior against its own people." She also said the United Nations should have the "decency and common sense to end this." MONUSCO's mandate was renewed at the end of March, but with a reduction of 3,600 in the troop ceiling. The mandates for peacekeeping missions in Mali, southern Lebanon, and the Central African Republic will also come up for renewal before the end of the year.